Among many kitchen knives made worldwide, knives made in Japan are popular not only in Japan, but around the world. 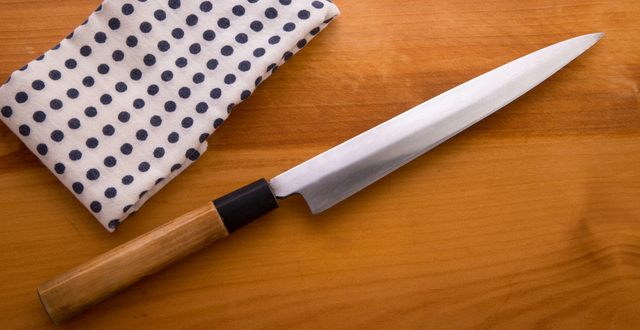 What makes Japanese kitchen knives so special, and why do many famous cooks love to use them? We focused on the reason of its fascination. It is said that kitchen knives started to be used in Japan during the Kamakura era. Kamakura era is known as the era when “Bushi”, also known as Samurai appeared on the stage of time. As they ruled the time, the production technology of swords developed rapidly, and in association the production of kitchen knives evolved during these times. Katana, the Japanese sword is made from “Tamahagane”, a steel with high purity which is made from iron sand or black sand. The sword is made by tempering the Tamahagane for about 15 times, and this technique is an original way which could be seen only in Japan. By the reiterated tempering, the sword is made from multi-layered steel, which makes the blade vey strong. The kitchen knives varies from simples ones for home cooking to ones with high quality for professional cooks, but all of those knives are made by the same way as Katana used to. The kitchen knives nowadays holds the romance of history, inherited from the Katana. Compared to foreign-made kitchen knives, Japanese knives are known for its sharpness in cutting. The reason for its sharpness could be the shape of the edge of the knife. The edge of most foreign-made knives are double edged, but Japanese knives are single edged, which makes it easier to control when cutting the ingredients. Also single edge knives makes it able to cut the ingredients without damaging the cell because the the blade has less trouble of frictional resistance, and by doing so, this keeps the flavor and the freshness. The edge of a Japanese kitchen knife is very sensible, so in order to keep the sharpness you must handle with care. To keep its sharpness, the knife’s blade must be sharpened by a whetstone every once in a while. To keep the beauty of the blade, it is necessary to acquire the techniques of sharpening. Professional cooks tends to sharpen their knives everyday. Although it is a very sensitive item, still the beautiful sharpness of the Japanese kitchen knives are so attractive that you would never want to use other knives once you experience the Japanese knives. You might not want to use Japanese knives for a daily use, but keep the charm for a special occasion!